Shopping for Lincoln Logs Construction Toys? 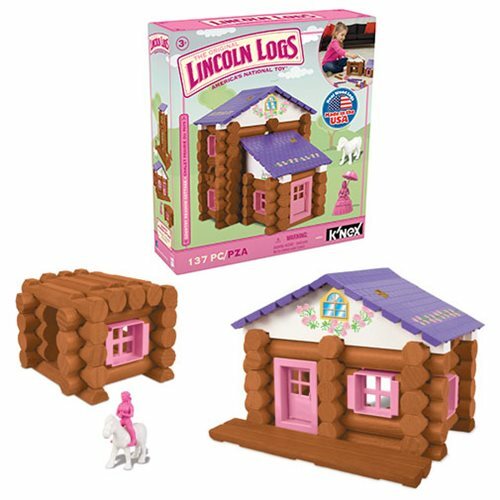 This set of Lincoln Logs building blocks has been designed specially for girls! The Country Meadow Cottage includes real wood logs, made in the USA, plus colorful figures and play accessories. Your little girl can build the cottage, decorate it with the included stickers, and then have fun playing with the included female figure and pony! Each set comes with building instructions and is packed in a handy storage container for quick and easy clean-up. Most models can be built one at a time. Contains 137 pieces. For builders ages 3 and up.